The Mark Davis Jointed Structure Head has the same Cobra Head design as on the Structure Jig but features a free swinging Z bend black nickel hook which is designed to provide maximum bait movement during slow retrieves. 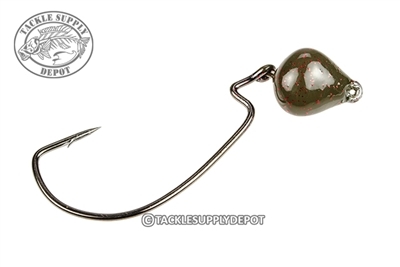 When crawled along the lake bottom with a soft plastic lure it keeps the lure in constant contact for superb feel yet is very weedless and has chip resistant Powder Coat paint. Attach any soft plastic bait like a Rage Menace, Space Monkey or Rage Bug and see the incredible action as it bumps structure and moves across the bottom! Also works great as a swimbait head with extra wobbling action and makes a Swimming Caffeine Shad really talk!